Is your CV boring? Naturejobs blog suggests an infographic approach. As careers consultants we see a lot of CVs. I mean, a lot. Every now and again (especially in the height of the Autumn term) it can make us a little CV blind. So we quite liked Dr Karin Bodewits and Philipp Gramlich’s recent Naturejobs blog on infographic CVs for researchers. They give three examples, including one we’ve pictured below, that tick the boxes of a good CV: clear structure and formatting, and all the important info is easy to access quickly. 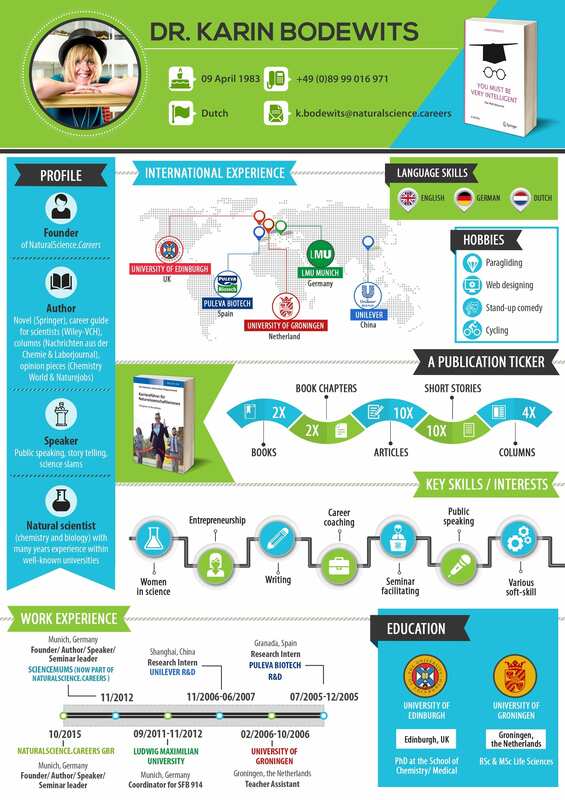 If you’re finding your CV a little boring and you love infographics, this might be worth a try. Just like Karin and Philipp though, we’d suggest really considering your target sector, organisation, and boss first, as this approach may not be suitable for the more traditional employer.